Back in 2014 we posted an article titled "Pele's Curse" which warned visitors about the perils of taking home lava rocks from Hawaii. The curse of Pele apparently will bring down tremendous woes to those who take her "children". Each year hundreds of packages arrive at the Honolulu Post Office addressed to Madam Pele and containing lava rocks from all over the islands. 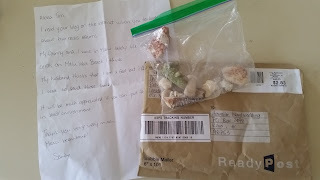 Recently, we received a package from Sandy from Canada, who saw the post Pele's Curse on this blog and sent back many corals she had collected on her recent trip to Maui. Although her husband thought she was being over cautious, my feeling is that it's better to be safe than sorry. This is not the first package we have received from visitors that contained lava rocks, coral and shells. It's best to just leave these things here in Hawaii in the first place. Here is a photo of the package she sent.